Foreground, middleground, and background are concepts that apply to many 2-D projects. They are evident in both still lifes and landscapes but for our purposes we’re going to stick with landscapes. The foreground, middleground, and background divide the landscape into different planes that the artist uses to create a sense of depth. The foreground of a landscape is generally closer to the bottom of the composition, although that isn’t always the case. Because this part of the scene is closest to the viewer the objects appear to be larger. The background of a scene is the furthest away. It gives some context to the scene, where it might be taking place. Because items in the background are meant to appear farther away they are much smaller in size, duller in color, and contain less detail than objects that are close to the viewer. The middleground is the space naturally occurring between the foreground and the background. Easy, right? 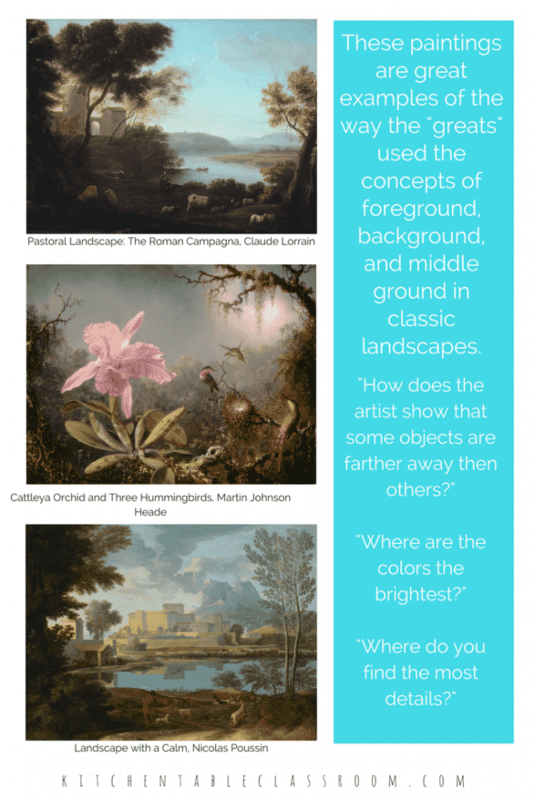 Introduce the vocabulary and discuss the concept of creating the illusion of space by using a distinct foreground, middleground, and background. The examples above are great conversations starters. Ask questions and let your kiddos have a discussion about what they see without having definite right or wrong answers. Introduce and discuss, but don’t worry if it seems the information isn’t sinking in. This is a complex concept. If your kiddo isn’t ready to completely understand it the next time they hear it they will at least have a context for the ideas. If your kids aren’t yet familiar with ways that artists create the illusion of space in an artwork be sure to check out this post. It contains a one page printable that outline six techniques artists use to create space within their work. The techniques are briefly outlines as follows. Refer to the space printable above for more information and examples of each technique! Overlap- Shapes in the distance will be overlapped by shapes that are closer. Shading- Adding shading and shadows to two dimensional shapes can make them appear three dimensional. Placement- Objects that are farther away are placed closer to the horizon line. Size- Objects that are far away appear smaller. Objects that are closer to the viewer appear larger. Value and Focus- Objects that are far away appear lighter in color and less clear than objects that are close. 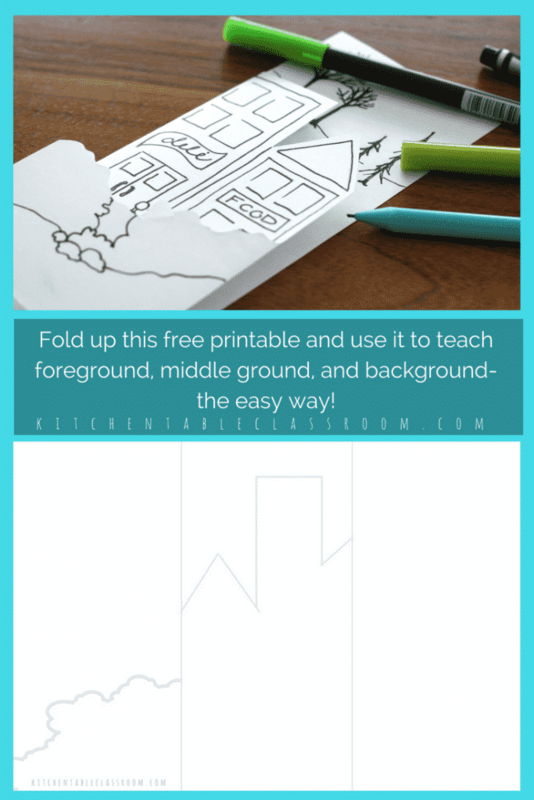 This post has a more in depth explanation and two more free printables to use with your students to bring the concept of one point perspective to life! These concepts go hand in hand with the concept of foreground, middleground, and background. IT can be helpful to introduce them around the same time, or at least review them. It’s impossible to create a foreground, middleground, and background without understanding some basic techniques that artists use to create space on a two dimensional paper. Though kids are starting with the same silhouette they will no doubt come up with unique solutions to fill their space. Supply pencils, markers, colored pencils, whatever floats your boat! Another quick and easy option is this painting with marker technique. 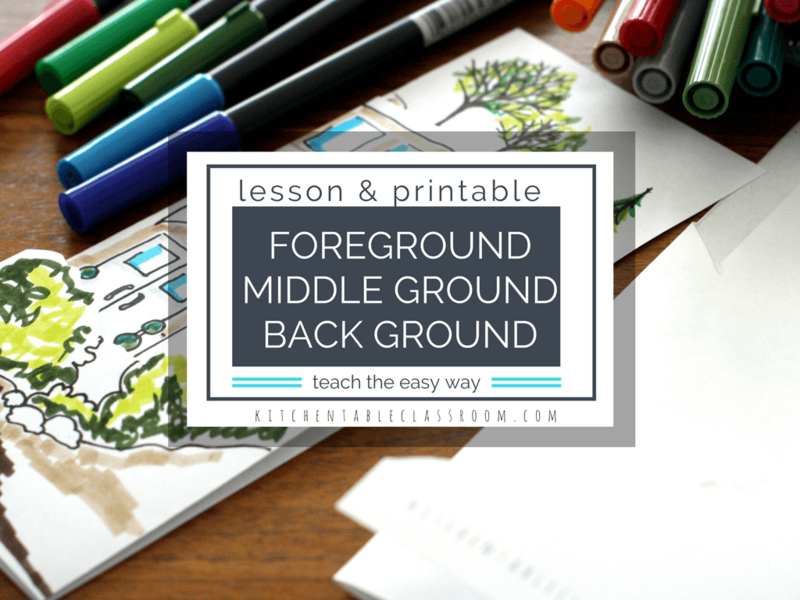 Want the free foreground middleground background printable to try with your students? Subscribe below.! You’ll get my newest free printable resources and fun projects delivered to your inbox once a week! Upon confirming your subscription you’ll get also subscriber only password to my Free Resource Library. This foreground, middleground, background PDF as well as dozens of other free art and educational printables are there in easy to print PDF form! The thumbnail for this printbale can be found under the heading “Art Tutorials and Printable Prompts.” Click that thumbnail and the PDF will pop right up. Already a subscriber at Kitchen Table Classroom…. If you’re already a subscriber at the KItchen Table Classroom there’s no need to subscribe again! Just use your subscriber only password to access the Free Resource Library and download away! And if you forget the password you can always find it at the bottom of every newsletter I send you! If you enjoyed this foreground middleground background post and printable please share it on your favorite social media channel. The handout cannot be found in the library and will not open from this link. Can you help? The handout is in the library under “Art Tutorials and Printable Prompts. Right now it is the first one in that category. From my end it looks like it is opening up the way it should but let me know if you have any trouble! All of my printables are located in PDF form in my Free Resource Library just for my subscribers. After subscribing and confirming you’ll get the password. Enter it in the Resource Library, link below. 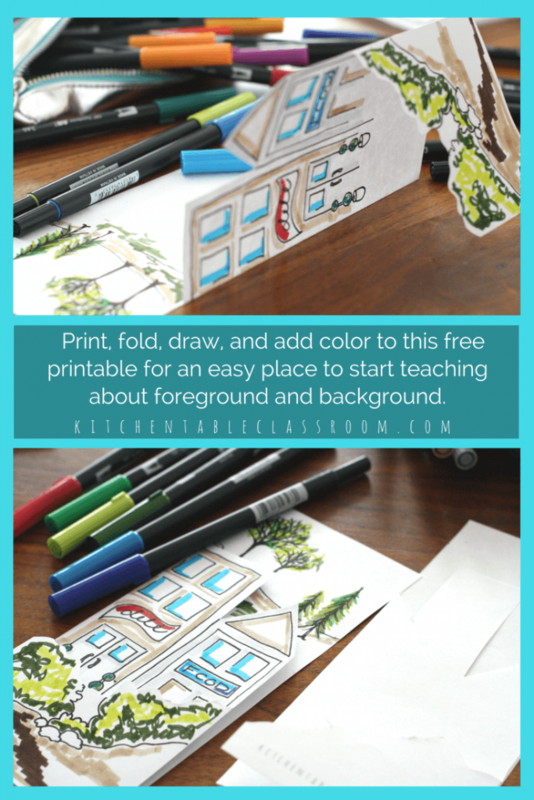 The landscape printable is under the heading “Art Tutorials and Printable Prompts.” Any questions just shoot me an email at kitchentableclassroom@gmail.com and I’ll d my best to hook you up! do you have to subscribe each time? There’s no need to resubscribe. Once you get the password it will work till further notice. 😉 The password and a link to my Resource Library come at the bottom of every newsletter or you can shoot me an email at kitchentableclassroom@gmail.com if you need help! How do we subscibe to get free printables? I can’t find where to do that. There are turquoise subscribe boxes in my sidebar, footer, and within posts that contain printables. Occasionally I have someone that can’t see them. The quick fix seems to be to open the page in a different browser. If that doesn’t work for you feel free to email me at kitchentableclassroom@gmail.com & I will do my best to hook you up! Hi, I when I click on the Free Resource tab it reminds me to sign up for the email newsletter. I have already signed up and received the email with password what am I doing wrong? I am trying to get to the page on the Free Resources tab that asks for the password to get the foreground middle ground, background pdf. and the password page will not come up. Help! At the top of the Free Resource Library there should be a box to enter the password- normally. I have had a few subscribers with missing boxes like you’re describing. What has fixed the issue for them is to open the page in another browser. If this quick fix doesn’t work feel free to email me kitchentableclassroom@gmail.com and I’ll do my best to troubleshoot for you! There is no picture when I open the foreground middle ground background pdf. Is there anyway you can help? Hi Pam, I’m sorry you’re having trouble. That PDF is coming right up here on my end so I’m not sure what the issue might be. Send me an email at kitchentableclassroom@gmail.com and I’ll hook you right up!